The T400-34 is the first wind turbine of the new generation. 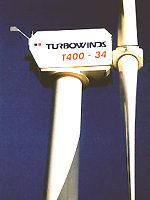 Certified by CIWI and built conform to ISO 9001 quality stan dards, the Turbowinds T400-34 has a rated power of 400kW. It has a 34m-diameter rotor with 3 wood-epoxy blades, a 34m tower and an induction generator producing 690 volts at 1,500 rpm. The T400-34 operates between wind speeds of 3m/s and 25m/s. It produces 400kW at a wind speed of 14m/s. With an annual average wind speed of 7m/s, the T400-34 produces 996,000kWh. If this amount of electricity were to be produced by a coal or gas plant, 916,320kg and 48,140kg of CO2 would be emitted respectively.